If you are the proud new parents of a baby son or daughter – Congratulations! 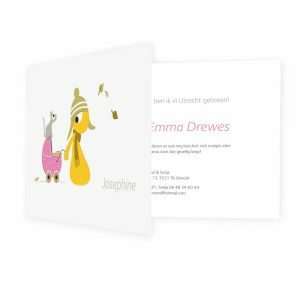 Share this happy news about your new arrival with family and friends with the Olli + Jeujeu birth cards! We have a lovely permanent collection of birth cards with Olli + Jeujeu illustrations. Choose your favourite card design form our existing artwork collection in either a fold-out card or a traditional folding card (landscape or portrait). 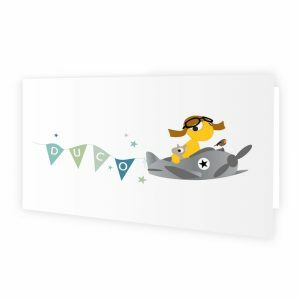 The matching envelopes are available in yellow or craft material (tough, brown postal material). The inside of the card you can customise using your own words or maybe a poem, your baby’s name and birth information. We can create the card in advance, after the birth of your child or children we will complete the card with the last details. After your final approval the cards are printed and you will receive them at your specified address. The printing costs depend on the number of cards, the card design and the finish. Please feel free to take a look at our lovely card design options. In this pdf you will find more information about the prices of the birth cards in our permanent collection. We can also create an unique custom made card with a lovely special design for your baby. Olli + Jeujeu and friends can all be created at your request for your unique card, as well as the envelopes in other colours and materials or use a wrapper. With the custom cards we first discuss with you your wishes for the design of the card and create a sketch of the illustration. We will prepare the final illustration and after your approval and the birth of your child or children we will finalise the card with the last details. After your final approval the cards are printed and you will receive them at your specified address. The printing costs depend on the number of cards, the card model and the finish. If you prefer we can also send the envelopes to you rather than you having to provide us with address information in advance. Olli + Jeujeu reserves the right to use the illustration designed for your card in the future. 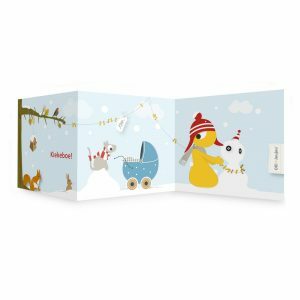 All parents using an Olli + Jeujeu birth card for their new arrival will receive an exclusive Olli + Jeujeu gift as a thank you for allowing us to make the birth announcement for you. In this pdf you can find out more information about the prices of our birth cards.